All water heaters are designed for heating water in conditions where there is no centralized hot water. There are several types of water heaters: cumulative (boilers) flow and of the gas column. In addition, the location of the tank they are divided into vertical and horizontal. The most convenient and practical – is a vertical electric storage water heaters. How to connect a water heater "Ariston"
flexible water hoses in a metal braid, 2 crane 0.5 inch, wrench 22/24, ribbon Fuma (special soft tape, designed for sealing threaded connections), power outlet (Euro) with grounding, wiring, brackets for attaching the heater to the wall, a screwdriver. Electrical accumulative water heater (boiler) heats the water to 55-75 degrees, and then maintains the temperature automatically. Since heating takes place gradually, such apparatus does not require large electric costs. Even the 150-liter water heaters consume no more than 1.5-2 kW. 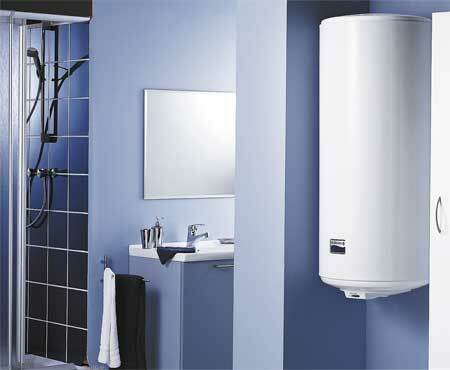 The capacity of the storage water heater can range from 10 to 500 liters. In flow-through water heaters the water is heated instantly, passing through the heating element of large capacity (capacity from 6 to 27 kW), therefore, the heaters of this type are immediately removed from the network more compared to boilers, the amount of electricity. On the other hand, instantaneous water heater can issue an unlimited amount of hot water and does not require regular maintenance. Gas instantaneous water heaters provide hot water. They are safe in operation: the safety valve with the thermocouple will block the flow of gas if the burner accidentally goes out. The ignition device is fully automatic and requires no adjustment, while ensuring complete combustion of the gas during start-up. In gas water heaters can smoothly adjust the water temperature, the automation will ensure its permanence, regardless of fluctuations in water pressure. For fixing on the wall water heaters take the brackets with the hooks, secure them firmly to the wall. On the back side of the heater there is a special hanging device with two holes. Hang the heater on the brackets. Now you need to bring cold water to the device by screwing the pre-to the intake valve ball valve and to the valve to screw flexible hose that connect to the water supply. The output of hot water put the tap, from the tap output hot water pipe hot water, which will go to the bathroom and the kitchen. At the same time the tap for the intake of cold water and tap hot water outlet, do not forget to open a hot water tap, for example, in the bathroom so the air came out of the water heater tank. When the water goes from the bathroom faucet, the tank of the water heater filled with water. Now you need to connect the water heater to the electric network. For this we need to install the socket (Euro) with a grounding contact, to bring to her a electric wire with a diameter of not less than 2.5 mm, it is better to separate the line from the meter. Ground in a separate building is best done in the cellar, scoring the iron area in the ground not less than 1 meter. Insert the plug of the heater into the outlet. Turn on the water heater START button (Power, select the temperature level. After about an hour the water is heated, and the heater is ready for operation. The brackets in the wall must be fixed very firmly, otherwise when filling the tank with water it can break. Grounding to avoid electric shock, must be reliable. Water heater to save electricity is to be incorporated. 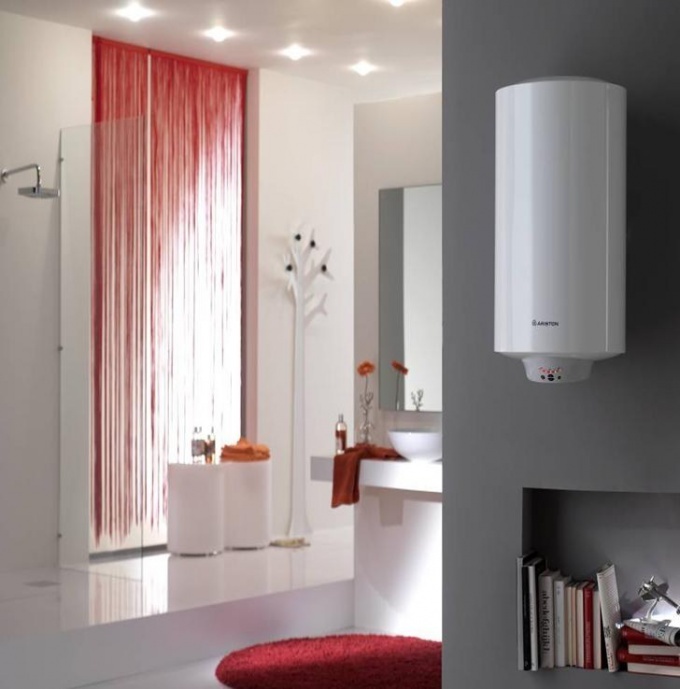 Advice 2 : How to connect a water heater "Ariston"
Products of Italian company "Ariston" known around the world for over 70 years. Russian consumers are acquainted with its products in 1993 and have appreciated their quality, convenience and ease of use. Today "Ariston" manufactures electric and gas water heaters are different in design and structure, flow and storage types. In flow water heaters heating occurs directly in the process of flow of water through the pipe. Cumulative usually have a stainless steel tank in which the recruitment and subsequent heating. Carefully read the passport device, pay attention to the installation instructions. Check the electrical wiring in your apartment, a voltage tester and a special flat screwdriver. The outlet for the water heater must be located in a dry place and have a grounding prong. The power supply for the electric heater must be connected by a special line directly from the switchboard. Select the place (a wall) the location of the water heater. For the water heater, the wall must be strong enough to withstand double the mass of the filled tank. In addition, the heater should be placed as close as possible to the place of hot water usage to avoid unnecessary heat loss. For proper installation of the heater in his kit includes the brackets and strikers. Focusing on the dimensions given in the instructions to drill in the wall at the selected location of the holes using a drill or hammer drill, insert the plastic dowels and dowel - screws. Fasten screws strikers, hang the heater on the plate with brackets. Connect water heater to water supply system using the pressure relief valve supplied with the device. The cold water pipe connected with the lower outlet of the valve. The warm water pipe connects with an outlet of the heater. Open the faucet, the cold water supply. In the future, it should always be open. Open the hot water faucet and wait until there will flow water, which would mean the complete filling of the tank. Close the hot water tap and plug the heater into a wall outlet. A few seconds on the control panel indicators will light, turn on the heater by pressing the "Vclick" and program it according to instructions.